Ahh, turkeys. The “original” American bird. Franklin wanted them for the national symbol, but of course we all know how that turned out. Now almost all of us experience turkey in all its glory once a year on Thanksgiving. Many of us, Lindsey especially, consider it their favorite meat and have it grace their sandwiches several times per week. Sadly, though, the only breed of turkey that many of us have ever tasted is the broad-breasted white turkey, a bird bred for confinement farming that can no longer breed naturally nor resist parasites or disease without antibiotics. Additionally, and like in the Cornish X chicken, the broad-breasted white has lost a good deal of the “turkey-ness” in its flavor. At Good Life Ranch, our turkeys will be raised out on pasture and in the woods without antibiotics. They will also be bred here at the farm. Therefore, we need a heritage breed that has retained its natural abilities to resist disease, evade predators, reproduce without “procedures,” and forage for its own food. The heritage breeds also have a much more pronounced turkey flavor that doesn’t bring “large chicken” to mind. The turkeys will forage on the grasshoppers, seeds, and grasses they can find on the range and contribute their manure to the soil. We will free range them most of the year and then put them into larger versions of chicken tractors for several weeks during the spring to breed them and collect the eggs for hatching. We are considering the following breeds, and we’ll let you know which breed or breeds we’re trying out during our first year. Bourbon Red – How could we have a farm in Kentucky without raising the Bourbon Red? This breed was developed in Kentucky in the 1800’s and was a popular breed up until the advent of the broad-breasted varieties. It still retains the old-time superior flavor and is said to reach ~22 lbs for the toms and ~14 lbs for the hens. This breed is on the watch list of the American Livestock Breed Conservancy (ALBC), but are gaining popularity in the last 10 years. The Bourbon Red is also listed on Slow Food USA’s Ark of Taste. 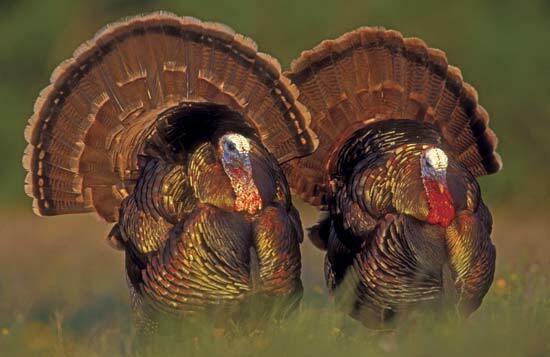 They are very pretty birds and we are definitely going to feature Bourbon Red turkeys at Good Life Ranch. Royal Palm – In my opinion, this is the prettiest turkey breed around. They are also one of the smallest, with larger toms topping out around 20 lbs. I just think that makes them a good bird for people with smaller families to feed! Honestly, who doesn’t get tired of turkey by 3-4 days after Thanksgiving anyway? This bird is a more appropriately-sized bird for most of our families. They are beautiful, tasty, and also on the watch list of the ALBC as well as the Ark of Taste from Slow Food USA. Narragansett – Until the development of the broad-breasted varieties, this was an important commercial breed. It has fallen out of favor in the last half century and is now listed as Threatened by the ALBC. The Narragansett is another heritage turkey breed on Slow Food USA’s Ark of Taste. About the same size as the Bourbon Red, the Narragansett has excellent foraging and laying attributes. I’ve read that after the brooding stage this breed is particularly adept at finding its own food. We’ll put them to the test! 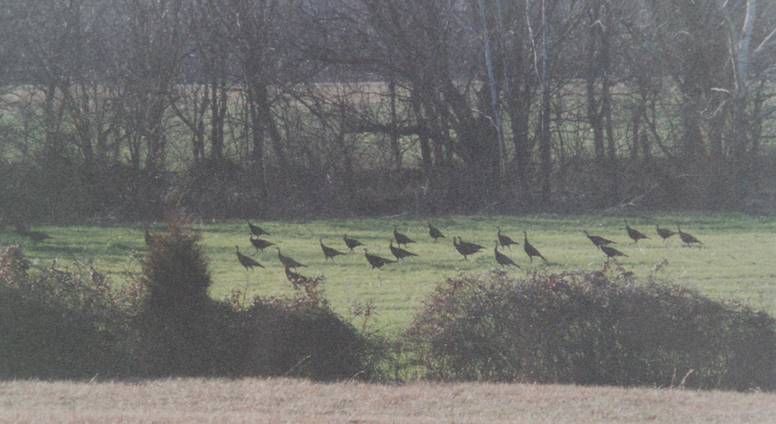 Our property has flocks of wild turkeys that will frequent the pastures as well. I might try to collect some eggs from them and see how the wild strain does in a pastured setting. Of course, that is all assuming that it is legal to do that. I’ll contact the wildlife department of Kentucky before I do anything like that, but it would be interesting to see how the taste and growth rates compare! I love the taste of duck! In my opinion it is the best tasting poultry. We have several ponds that ducks can make their own as well as a large garden in which ducks can be invaluable assets in the never-ending battle with slugs and snails. Some duck breeds can also produce prodigious amounts of eggs as well. Ducks will be brooded like the chickens and turkeys. Our meat ducks will be used to improve pasture fertility while our egg layers will take care of the gardens and ponds. Indian Runner – Very good layers, producing around 200 eggs per year! They are also very active in their search for slugs, snails, and other undesirables in the gardens. They walk very upright for a duck, and are on the Watch list of the ALBC. Campbell – Another breed on the ALBC’s Watch list, and another fantastic layer. Many reports list this breed as laying 250-340 eggs per year! They are also extremely adaptable climatically, which will be good in a temperate place like Kentucky. Cayuga – This is a black duck that (at least early in the laying season) lays black eggs. The meat is reportedly of excellent quality, but the black feathers make processing the birds into a presentable carcass quite a challenge. They are a Threatened breed according to the ALBC and the only duck on Slow Food USA’s Ark of Taste. White Pekin – The world’s premier commercial meat duck. They can reach 8 lbs in 9 weeks, according to many sources. Their white plumage also makes them relatively easy to clean, at least as far as waterfowl go, and presents a clean carcass. I just have reservations about them because in my mind I have made them the Cornish X of duckdom. Geese will weed our gardens and food forest, provide fertilizer where we want it, and actually deter some of the predators in our ecosystem with their defensive displays. Geese also respond to unfamiliar people, vehicles, and animals with loud honking, and so make good watch animals. Of course, in the end, roast goose is amazing! American Buff – Developed from the very beautiful wild Greylag Goose, this breed was indeed produced here in the States. It has fallen out of favor and is now listed as Critical with the ALBC. They are calm and docile as far as geese go, and make good parents. It has light-colored feathers that help with presenting a good carcass to customers and is a pretty large roasting bird. The American Buff has made Slow Food USA’s Ark of Taste. Cotton Patch – Another American breed descended from the Greylag, the Cotton Patch got its name from its original function – weeding the cotton fields of the southeastern United States. Now listed as Critical by the ALBC, it may find a home at Good Life Ranch performing its originally intended function of weeding our food forest and gardens. They do have light plumage, but I have found no information on them as table fare. They do fly better than most geese, though, which is a trade off for us between having them more easily escape predators and keeping them home on the ranch. The Cotton Patch is one of three goose breeds placed on the Ark of Taste by Slow Food USA. The guinea fowl will be our tick assassins! Their job on the ranch will be to eradicate ticks that might normally bother us or our livestock. Guineas also make good watch animals as they start a ruckus whenever anything unfamiliar wanders into their sight. Some people allow them to roam wildly over their property, but they seem to lose a lot of birds this way. We’ll try to try ours to come back to a coop at night so that we keep as many members of our flock intact as possible. We’ll keep a deep layer of composting material and worm beds in the coop as well to utilized the nitrogen and spilled feed of the guineas. I’ve heard that guineas taste excellent as well, but I have never had one myself and we’ll probably be utilizing them primarily for their tick eradication skills rather than as roasting birds. I’m not sure which color we’ll get – I may defer to Lindsey on the colors. Well also have to find some way to keep them away from our planned beehives, as I’ve seen the guineas at Heifer Ranch just stand in front of the hives and pick off the bees as they come and go. Well, that’s about all for the Poultry Planning Posts for now. We’ll move onto hogs, ruminants, rabbits, and fish in future posts and keep you posted on the varieties we’ve chosen once we launch. Well we are now 23 days out from populating the ranch ourselves, and for a long time my thoughts have kept returning to the question of what livestock and breeds will occupy the land with us. I’ve been trying to think of everything from a land stewardship and ecological point of view; trying to picture all of the different tasks we want our animals to accomplish for Good Life Ranch and how those pieces fit together in the manner we want them to. That means that we want the outputs or “wastes” of one system to provide the inputs of another. I’ll try to discuss this aspect in each post and provide a summary in the final post on the livestock breeds. Here’s my thoughts so far, which I’m sure will change as we get to the land and encounter all of the opportunities and challenges that it has to offer. Of course, all of our animals will provide manure to fertilize the soil. 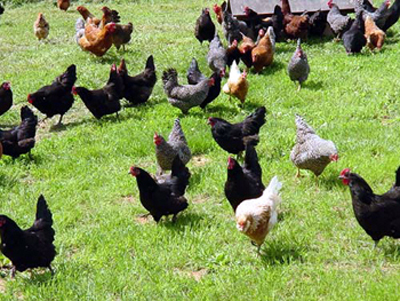 However, the chickens will probably be the first animals on the farm and will provide the initial source of nitrogen to rejuvenate the pastures. Our pastures have not been utilized by domestic animals for a long time, if ever. For the last 10 years about half the fields have been hayed each year with no grazing and the other half of the fields have been used for corn by an Amish farmer whose property adjoins ours on the east. Since there hasn’t been any grazing going on in most of the fields, they haven’t been fertilized in any way for a number of years. The fields that have been used to grow corn have been spread with manure every year, but luckily no chemical fertilizers have been utilized. We’ll use some form of chicken tractor or prairie schooner to help protect the chickens from the numerous predators (our property at least has mink, hawks, and bobcats on it, maybe some other critters as well) and to help the chickens put their manure where we need it most. Since we don’t have fences yet either, chickens will be the easiest animal to keep on the property as well and the tractors or schooners will help keep them off the highway. We plan on having broilers and a laying flock. We’ll start with the broilers and a few laying hens for our own use and add a larger laying flock after we acquire some of the ruminants for the layers to follow around the pastures. We want to get a nice dual purpose breed for several reasons. First and foremost is that we want to be completely sustainable. That means we want to hatch out our chickens on the ranch and not have to order them from distant hatcheries. Second, and more importantly, I don’t agree with the policy many hatcheries have of killing the male chicks of the laying breeds. I understand that the male chicks are not profitable for the hatchery, or at least are more profitable as fertilizer or chicken meal, but one of the main reasons we want to embark on this venture is animal welfare and my value system cannot support the mass slaughter of male chicks. Of course, we may have to order from a hatchery initially to get started, but we will at least check around locally and see if anybody has a good flock that we could use to get started. Anyway, I want to get a dual purpose breed where the females we hatch out can join our laying flock and later become stewing birds and the males that hatch can become pastured broilers, fryers, or roasters. Here are the breeds I’ve looked at and some thoughts about each. Except where noted, we will probably try out several different birds in an effort to see which breed performs best in our particular location. There are many other breeds out there, and I’ve by no means found them all! This list is just of ones I specifically do or do not want to try. Cornish X – I looked at this breed initially. It’s what the Salatins raise and it’s by far the cheapest option, both in terms of the price of chicks and in terms of growing out, as they have the best feed conversion ratio. However, the early maturation doesn’t allow the flavor of the chicken to develop. This bird may be single-handedly responsible for everything tasting like chicken. They also are developed for confinement, not for the pasture and do not seem to have some of the foraging instincts that other breeds do. They may drop dead from developmental issues caused by their incredible growth rates if you don’t process them in time. For these reasons, we will not be raising Cornish X. Black Australorp – above average layers and supposedly can grow fairly quickly as well. They are a calm bird and are well-adapted to free-ranging. This breed would allow us to utilize both the males and the females. They are a brown egg layer. Downside is that the dark feathers can leave the processed birds less than appealing to some customers. 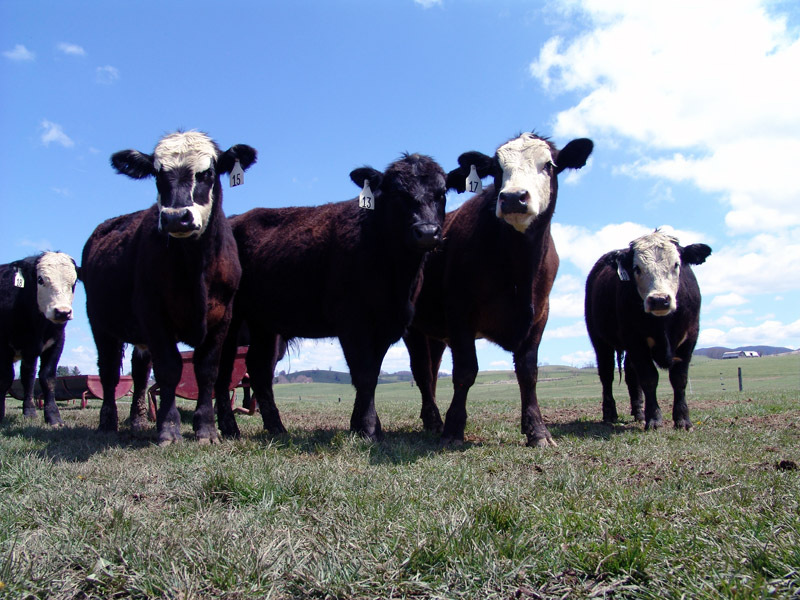 They are on the Recovering list of the American Livestock Breed Conservancy (ALBC). Delaware – this breed began as a broiler cross, but was true-breeding and a good layer as well. It’s light in color, very hardy, early maturing, lay brown eggs at a good clip, and free range well. The ALBC lists the Delaware as a Threatened breed, and the Delaware is listed on Slow Food USA’s Ark of Taste. Orpington – specifically the Buff variety because of their lighter feathers to make things easier in processing them. They are supposed to be good cold weather layers and above average layers in general. They are also early-maturing and can grow to a good size for meat. Adaptable to free-ranging. Listed as a Recovering breed by the ALBC. Araucana/Ameraucana – these probably won’t form a big part of our flock, but I just like ‘em. They will play a role in our Lifestyles Lane experience. These birds originated in South America and are often called Easter Eggers because of their blue- or green-tinted eggs. They free-range well and will help make the South American portions of Lifestyles Lane more authentic, but will probably not factor into any commercial egg or broiler production for us. The ALBC lists these breeds under their “study” category. Rhode Island Red – obviously, a red-feathered bird. That may make a difference to customers at processing time, but they are very good brown egg layers, very hardy in all weather, and not broody. 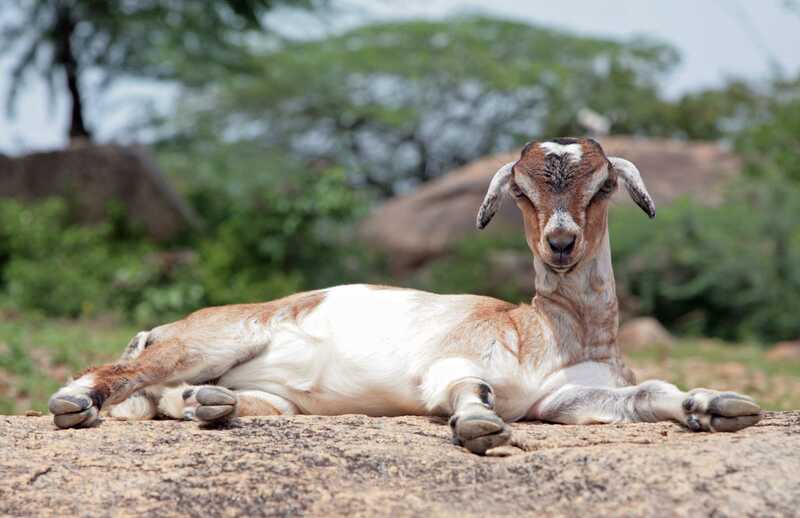 They are active free-rangers and can reach 6-7 pounds, so the males may make passable broilers on pasture. Some strains of this breed have been industrialized, but we’d be after the more traditional lines. 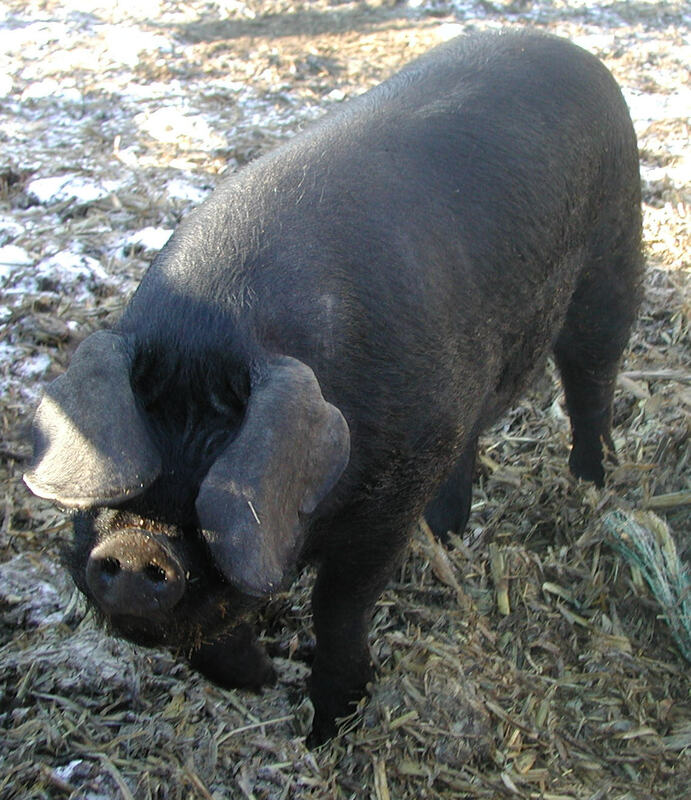 The non-industrial lines of this breed are listed as Recovering by the ALBC and are on Slow Food USA’s Ark of Taste. White Rock (Plymouth) – the unlisted part of the Cornish X. White rocks have white feathers that come off cleanly at processing time, grow rapidly and have a pretty quiet disposition. Some strains are pretty much confinement only birds, but other strains are starting to be developed for pasturing. They are supposedly pretty strong layers of brown eggs as well. A common breed that isn’t in any danger of decline. Other breeds we may eventually investigate as broilers only include the K22 Red Broilers and the Freedom Rangers. I’d rather go with one or more of the dual purpose breeds above, though, for the sake of simplicity and in the interest of breeding our own flock and not having to reinvest in chicks each year. That saves us about $1-$2 per finished chicken, which is a rather high percentage of the total cost of production. The chickens, no matter what breed or mix of breeds we end up utilizing, will provide fertility to our soils through their droppings, scratch through the manure of the ruminants that we will add to our enterprise eventually and eliminate or reduce the fly problem that many ranches experience. In addition, they will take care of windfall fruit around our fruit trees and in our food forest (more about that in an upcoming post) and dispose of garden and kitchen scraps. By products from chicken processing (blood, feathers, entrails, etc) will be composted and then used to fertilize our food forest, gardens, and pastures. The only inputs into this system should be a one-time investment in chicks, incubators, and brooding equipment as well as a recurring cost in chicken feed. Outputs include meat in the form of broilers, fryers, roasters, and stewing birds, eggs, manure, and organic materials for composting. Coming up next – turkeys, ducks, geese, and guineas!